Marketing teams are now expected to churn out a nonstop stream of qualified leads for their sales departments. Webinars should be a tactic every marketer uses. 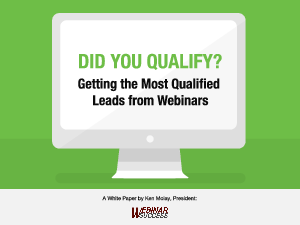 This paper will help you establish best practices during webinar production, promotion, delivery and follow up as you identify and qualify sales leads. The included tips assume a business-to-business.